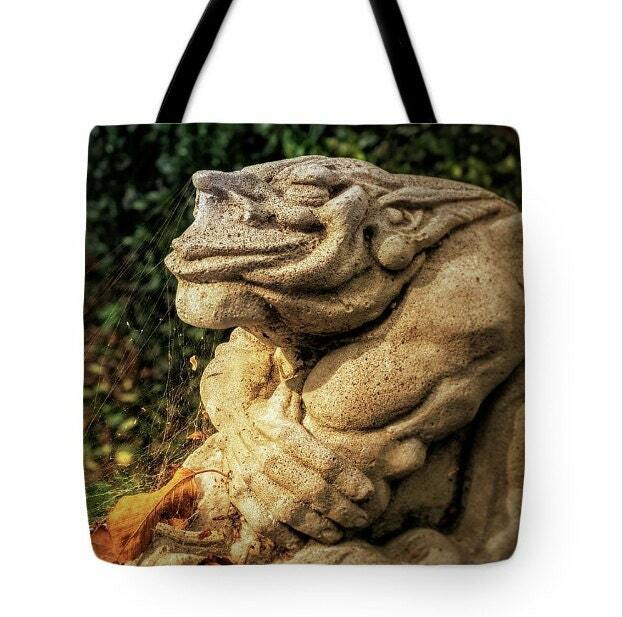 How can you not love the face of this 'adorable' gargoyle basking in the sun? He's been snoozing for sometime as you can see by the leaves caught in the spiderwebs surrounding him! Fun canvas tote for the fall months and of course to celebrate the festivities of Halloween. Tote bags are made in America. Material is a soft, durable, poly-poplin fabric and include a 1" black shoulder strap for easy carrying. Available in three sizes from 13" x 13", 16" x 16" and 18" x 18". Image is printed on both side. Tote can be machine washed with cold water, lay flat to dry. Totes are custom printed at the time of your order and shipped directly to you from the printing facility. Timeline for printing the material, sewing, etc is usually 4 - 7 business days, then it's ready to ship.